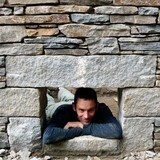 My name is Marc Archambault and I am a stone mason and artist based in Asheville, North Carolina. I practice traditional, old school masonry techniques and create natural stone mosaics. I started setting stone in 1997 and have steadily grown in my ability to imagine a project and implement complex designs. My stonework is an artful balance between bomber structure and graceful aesthetics. I am a strong advocate of drystone construction. In many instances, building dry- without mortar or concrete- creates more durable and more beautiful works, that are gentler for the environment. I am skilled with mortared work as well, and I take care to choose the best methods for each project. In addition to building with stone, I am devoted to sharing the craft with others; I teach stonework classes and maintain an active website and stonework blog. 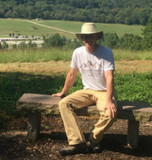 I am a member of the Stone Foundation and Handmade in America. I am very interested in sustainability in stonework construction and have written and presented on this topic. Hammerhead Stoneworks offers masonry and design services for discerning clients across the Southeastern United States. We are a quality driven, craft oriented small business. We practice old school stone construction techniques. About Hammerhead Stoneworks Hammerhead Stoneworks is my company, founded in spring 2009. I worked for the Unturned Stone for six years as a mason, designer and project manager. I mostly work in and around Asheville, but can be persuaded to go just about anywhere for the right project. Since founding Hammerhead, I have done projects in Chapel Hill, NC, Rock Hill, SC, Atlanta, GA and Gainesville, FL. Cane Creek Concrete provides many options other than plain concrete to accent your home or business. Decorative concrete can be made to look like slate, cobblestone, brick, rock, etc. We have many colors and textures to match or contrast any color. Quality Contractors designs and installs new concrete driveways in Asheville and the surrounding counties. We also remove and replace driveways. Call today for a free concrete driveway estimate. We provide free driveway design on all our projects! We are also a paver driveway, patio and walkway installer/contractor serving Asheville, Hendersonville, and all WNC counties. Quality Contractors also builds retaining walls in Asheville, Buncombe , Henderson and all WNC counties. From installing new exterior columns to repairing your chimney, masonry contractors can help you add both visual appeal and value to your property. They’ll know what kind of installation makes the most sense for your Hoopers Creek, NC climate and regional style. Looking for something that will develop a patina with time? Or would you rather have your home feel brand new for years to come? Choosing the right kind of stone involves thinking about the future, too. Experienced brick suppliers and stone suppliers can help you find the material that will work for your home now and for years to come. These professionals aren’t limited to exterior work either. Whether you want a split-stone granite wall in the kitchen or need help installing traditional brick masonry on your fireplace facade, you’ll want a professional to get it right. If you’re already working with an architect or designer, he or she may be able to suggest a good Hoopers Creek, NC subcontractor to help out. Here are some related professionals and vendors to complement the work of stone, pavers & concrete: Landscape Architects & Landscape Designers, Architects & Building Designers, Garden & Landscape Supplies, Driveways & Paving, Siding & Exteriors. Find stone, paver and concrete professionals on Houzz. Search the Houzz Professionals section for Hoopers Creek, NC stone, paver and concrete professionals. Browse photos and read reviews, and contact a pro if you like their work.